This is a parent participation class designed to welcome very young athletes into the gym. Children will be able to explore the equipment and learn exercise while having fun! Gymnastics will help establish balance, flexibility, muscle memory, body position and beginner tumbling. 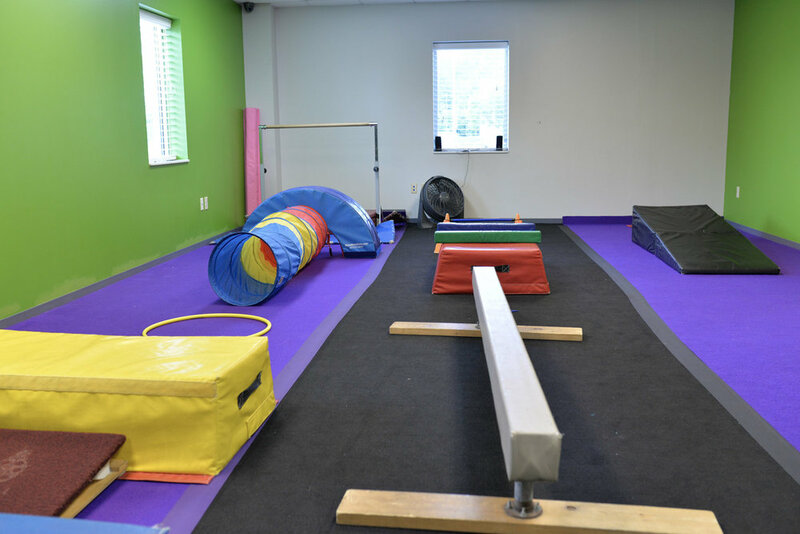 Our classes consist of stretches, obstacle courses and activities on equipment. 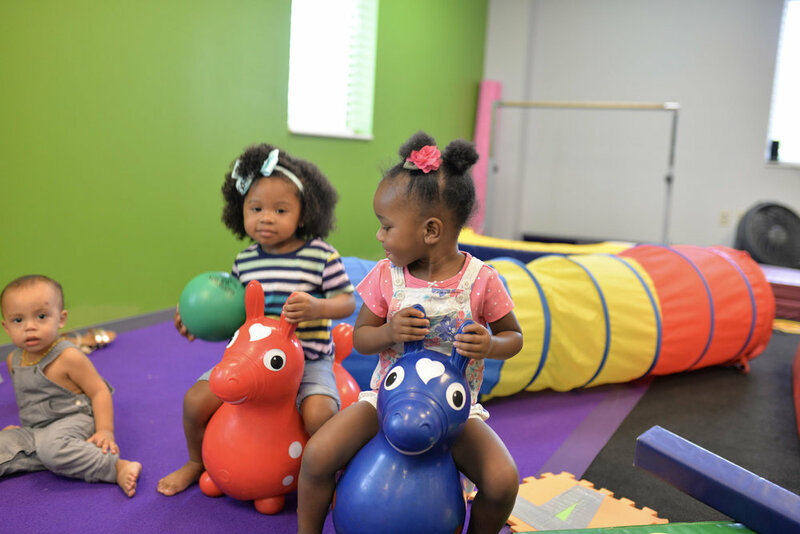 Your child will be able to walk on the balance beam, climb, hop, log roll, forward roll, backward roll, crawl, donkey kick, etc. This class will introduce students to learning basic gymnastics skills alone with the instructor. Children will begin learning basic gymnastics skills and proper techniques. Children will work on skills and drills to establish their balance, flexibility, strength & coordination. Gymnastics related games, learning activities, and obstacle courses will be incorporated along the way. They will be able to experience the fun of gymnastics and getting active! Our athletes will continue building upon their athletic skills while advancing their basic gymnastics skills. They will be able to use the techniques learned in previous classes to improve strength, muscle memory, body position and body awareness. Athletes will learn skills such as cartwheels, handstands, pullovers, etc. Children will also be able to experience class time on the big kid equipment such as the vault, bars, beam and floor. This class is designed for Boys & Girls 6 & up. Athletes will be able to learn beginner gymnastics skills on all 4 apparatus: vault, bars, beam and floor as well as trampoline and rings! Children will learn the fundamentals of gymnastics, learn proper technique and body positions. Classes are 1 hour long. This class is open for Boys and Girls ages 6 & up and for athletes who have had experience in gymnastics. This class will take it to the next level by challenging your child with more advanced gymnastics skills on all the apparatus. Skills will be evaluated to move up to this class. Our beginner tumbling class will work on basic floor tumbling skills beginning with cartwheels and round-offs to back handsprings! We incorporate stretching and conditioning along with progressive drills to build up athlete’s strength and tumbling skills. Boys and girls ages 6 & up are all welcome to join the class! Int/Adv Tumbling is for boys and girls ages 6 and up. This class is for athlete’s who are more advanced and have experience with tumbling. Athletes must be able to do a standing back handspring to participate in the class. Athletes will work on: standing tumbling, series tumbling, front tumbling, twisting, and more. For Boys and Girls! This class teaches strength, agility, creativity, discipline, and total body control. Each class will feature obstacle course training and conditioning. The class combines multiple components such as: gymnastics for safety, martial arts for control, parkour for coordination, and more. This class will have your athlete feeling confident and tired when it's over! Our Hip Hop Dance Class will teach your child hip hop dance moves and techniques to upbeat and energetic music. They will learn the history and correct terminology of the hip hop culture. Your child will be able to express themselves through our dance choreography while having fun and getting fit! Hip Hop Dance is a great way to improve endurance and coordination while providing health benefits. Creativity through our workouts is the best way for your child to associate fitness with fun! Boys Gymnastics (Ages 6 & up) Our Boys Gymnastics class is for boys ages 6 years and up. Gymnasts will learn skills on all 6 men's gymnastics events: floor, pommel horse, rings, vault, parallel bars, and horizontal bar. There is a strong emphasis placed on conditioning and strength building. Boys in our program will learn the importance of combining goal setting and self-discipline with fun and enthusiasm. This class will send your gymnast home tired! Create your own class at a time that works for you! This class can include gymnastics, tumbling, hip hop dance, or fitness. There is a minimum of 3 participants per class. Create-A-Classes are great for athletes with special needs, play dates, dancers, cheerleaders, various organizations, and more! A minimum of 3 participants are required to start a class. Sessions are paid for 4 classes at a time. A $60 annual registration fee must be paid for new members ($15 for each additional sibling). Call 614.571.1220 to schedule your Create-A-Class! Create an Account to Enroll, Make Payments, and more! Practice 2 days per week! Practicing more than once a week will increase strength, coordination, endurance, and confidence. Enjoy our program All Year-Round! Classes are offered on a monthly continuous enrollment. Tuition is pro-rated if joined later in the month. HOW TO ENROLL: Enroll Online Here! Create an account to Register For Classes and pay monthly tuition. You can also Call 614.571.1220 (Columbus Location) or Email Info@GymSkills.com to enroll! Monthly Tuition is based on the number of weeks in the month. Click Here for our full list of Class Procedures and Policies plus tuition amounts! Gym Skills encourages all children to live a healthy and active lifestyle! Our main focus is to get each child up and moving, and having fun! Children will develop their strength, balance, flexibility, coordination and body awareness that all aim to improve a child's health. Children will not only gain the many health benefits of being active, but classes will help develop social learning and cognitive abilities!